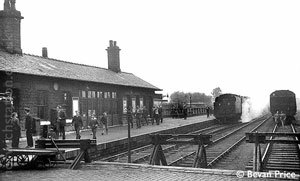 Horwich is most famous for the Locomotive works built by the Lancashire & Yorkshire Railway, but it once also boasted its own terminus railway station. On 27th September 1965, however, Horwich Station fell prey to the Beeching Axe and it closed to passenger traffic (the last train left on Saturday 25th September 1965). 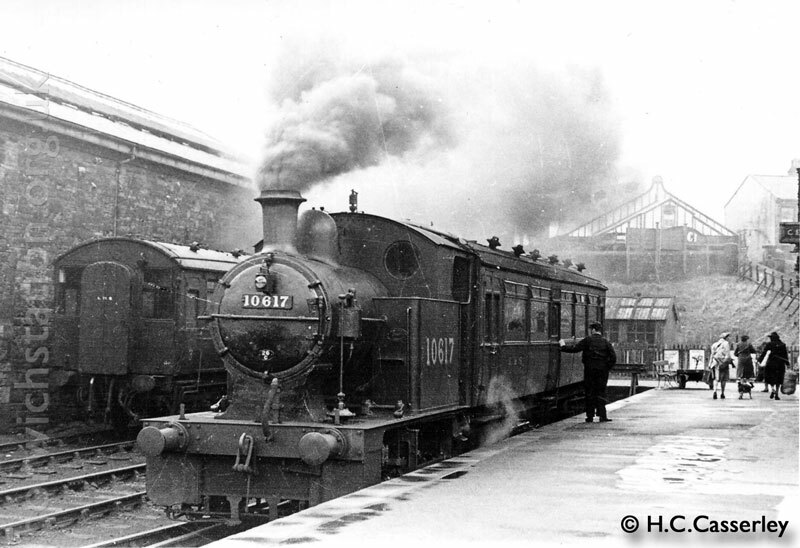 10617, (built 1911 at Horwich) the 'Blackrod Jerk' railmotor waiting at the platform on 22nd April 1947. The railmotor, which consisted of a single carriage connected directly to a locomotive, could be driven from both ends and was used for the short journey to Blackrod Junction. Science and Society picture library have a 1925 picture of the loco without the carriage. The goods station initially remained open but that too closed the following year. The site of the station has since been transformed into a recreational area - Old Station Park. Since most research into railways in Horwich concentrates on the loco works, the aim of this website is to detail as much of the history of the station as possible, including the links to the main line. An obvious difference between a book and a website is that a website is effectively always a 'work in progress', so while you will see that not all sections have been completed, equally, as new information comes to light, pages can be updated and expanded. If you have anything to contribute, or spot any glaring errors, please let me know. While the site will obviously include lots of factual information such as photographs, maps and diagrams, I am also very interested in including people's personal memories of the station, both before and after closure. If you have anything you can contribute, please contact me. All material is credited unless you request otherwise. Pictures of the station area following closure and prior to the creation of Old Station Park. Did you play on the site after it had closed? I have heard one rumour that someone wanted to convert the disused station buildings into a restaurant. Is this true? Were you involved in the campaign to reopen the station?